3a Alloway Avenue is a stunning 3 bedroom detached bungalow. 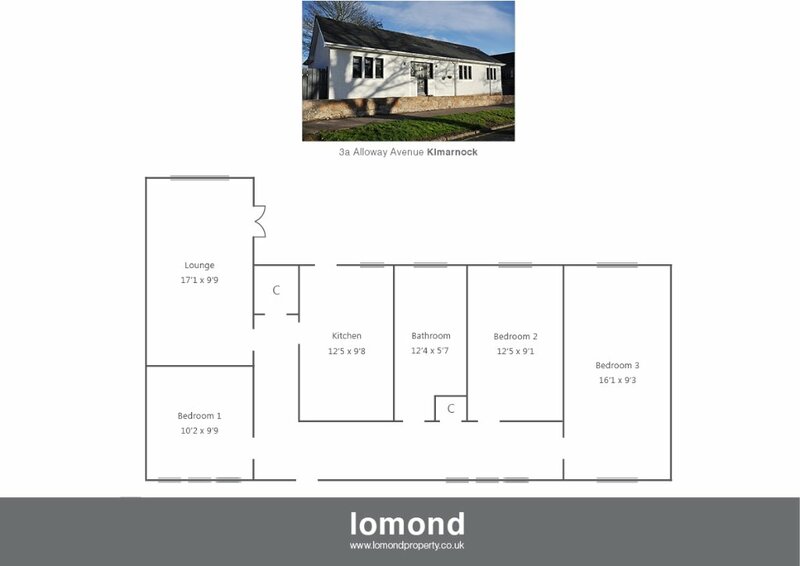 Located in this sought after area of Kilmarnock the property has recently undergone a comprehensive program of upgrading and redecoration to create an excellent on the level family home. Off street parking to the side leads to landscaped rear garden. The property comprises of entrance hall with hardwood floor. The lounge is situated to the rear of the property with French doors leading out to the garden deck. The dining kitchen overlooks the garden and comes with built in electric oven, gas hob, with chimney hood extractor above, integrated fridge/freezer, dishwasher and washing machine, the kitchen has been beautifully finished with splash back surround and ceramic sink. The family bathroom has been configured to allow for both a bath and freestanding shower enclosure, white suite with vanity unit, mirror, towel rail and tiling. Three double bedrooms and two storage cupboards are all accessed off the hall. The upgrading of the property includes hardwood internal doors, new Alpha boiler, new double-glazed windows and external doors, carpets and décor throughout. Externally a paved pathway leads to the front door, to the side the driveway is accessed via gated entrance and leads to the rear garden which has been landscaped with decorative chips, feature deck. A further space can be found to the back of the lounge and may be suitable for housing a small external shed. Alloway Avenue is situated within close proximity to Kilmarnock Town Centre, the local amenities include retail shopping, bars, restaurants. Both primary and secondary schooling options are available within the town. Access to local road networks is excellent and the local train station provides routes to Glasgow and beyond. On entering Kilmarnock at the Bellfield Interchange, follow Queens Drive / A735, following the one way system through the town, continuing on the A735, follow signs on the left for B7073 / London Road, when on London Road continue along before taking a left onto Walker Avenue, follow the road round and onto Alloway Avenue.